Our Totem Column Light Box is a free standing double sided illuminated column which is ideal for displaying advertising posters or promotions. 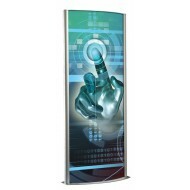 Featuring a front loading snap frame system, you can change you posters quickly and conveniently. Our light columns are internally illuminated with fluorescent tubes and have opal acrylic sides and an anti-glare cover sheet to protect your display. This is a premium quality, highly versatile display solution. All units are supplied with CE/UL Pat test and certificate. They are supplied unassembled with a 2 metres long cable and full assembly instructions. 600mm Light Column Lightbox, Illuminated Column Display Our Double Sided Freestanding light u..
700mm Light Column Lightbox, Illuminated Column Display Our Double Sided Freestanding light u..